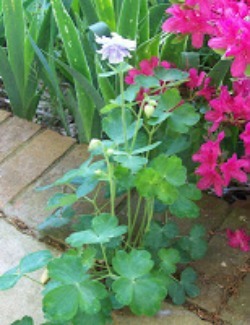 I had been watching this Columbine grow in the bit of soil between the bricks and concrete on my front porch. I at first could not believe it when the plant grew steadily and then flowered in this impossible space. The most amazing thing is that this little plant has come back year after year and from its seeds other plants have joined it and grown along this little border! And of course some dandelions have joined the line also. It just shows one what can happen in the face of barriers being thrown in your way and what sheer determination can do to overcome obstacles! It also shows how your battle can gather others to support you as long as you keep coming back and sticking it out. It can be amazing how we can see answers in nature the struggles that we all deal with and confirmation of how we should lead our lives. I feel like I have burst through that concrete and am growing. I have completed some soap challenges and have liked how they have turned out. I am in the process of making my Holiday Soaps with some new blends. I have asked for support from some like-minded business entrepreneurs and feel myself to be blooming this season. What a beautiful lesson to be learned and applied to our daily lives when things get us down!